A versatile board, with great sounds. Let down by its stepping filter and unintuitive interface. Surprisingly portable. Great soundset. Doubles as a USB Audio/MIDI interface. The MOX 8 offers much of the Motif XS's functionality in a convenient package. Despite boasting an 88-note keyboard, the MOX 8 weighs in at just 14.8kg. It's long been a tradition for manufacturers to launch ﬂagship boards then filter down the technology to lower priced variants and this is very much the case with the MOX 8, which is largely based on the now discontinued Motif XS. A quick overview of the sound engine shows that the MOX 8 uses the same basic waveforms as the Motif XS (355MB), though it's a shame some significant features have been lost. "When it comes to sounds, there is everything you need, from standard tones to more off-the-wall effects." Polyphony is halved from 128 notes on the XS to just 64 notes on the MOX 8 and in practice you can easily start eating up polyphony on more complex layered patches. Also, the sampler and aftertouch is gone, plus the large screen and the eight real-time sliders, but the 16-track sequencer and pattern/phrase/ loop sequencer remains. 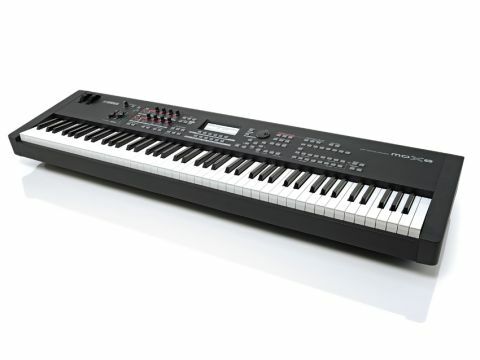 The MOX 8 is surprisingly portable for an 88-note weighted keyboard, weighing in at just 14.8kg (32.6lbs) as opposed to the Motif XS 8 that weighed in at 28.6kg (63lbs). This is a significant difference and one that finally makes it possible to easily gig viably with Motif sounds in an 88-note board - in fact it's even lighter than the latest Nord Stage 2 HA88, which weighs in at 18.5kg (41 lbs). The graded action is good but not great - yes it feels high quality but there is too much downward key travel from initial touch to triggering the sound (though using different velocity curves offsets this to some extent) and the key return is a little sluggish for truly responsive playing (a criticism we also angled at Korg's SV1 RH3 keybed). Construction is fairly sturdy, with a lightweight moulded textured plastic case and the switchgear feels as solid as on the XS/XF. However, interface-wise we still feel there's much room for streamlining. The monochrome screen is small and in the sequencer (and some edit modes) it's hard to decipher, plus there's too much button-pressing involved in many operations (do we really have to press 'Exit' so much?). There also aren't enough dedicated real-time controllers for a performance instrument (the four 'part' volume sliders that were present on the outgoing MO are now gone which is a backwards step) while the learning curve is still fairly steep compared to Nord's and Korg's. Also, the pitch and mod wheels are placed too far away from the keyboard for comfort, while there is a lot of dead space to the left of the panel. It would have made more sense to shift all the front panel controls further to the left to leave space on the far right for a laptop or iPad. The sound and mode structure is familiar territory for Motif/Yamaha users. Voices can have up to eight elements (waves), Performances allow layering (including velocity layering) and splitting of up to four of these voices (including drum tracks and up to six arpeggiators for intelligent performance-led backings or patterns) and the quick layer and split buttons are a godsend for live performance and quick patch setup. There's also Master mode for using the MOX 8 as a controller board (with up to four zones for controlling other MIDI gear) plus Song mode, which can be used as a 16-part sound bank/mixer to use with the 16-track sequencer, or to use for directly accessing up to 16 sounds for live performance. When it comes to sounds, there is everything you will likely need on-board from bread and butter stuff, through to more off-the-wall sound effects. The pianos are versatile and responsive, the EPs are warm and detailed and sound great in a mix for both comping and solo work (especially when coupled with the powerful high-quality modelled VCM/REV effects) and the acoustic sounds (percussion, drums, solo/group strings, acoustic guitars, woodwinds and brass) are superb and helped greatly by the extra articulations available and switched in and out by the AF1 and AF2 switches. String slides, brass falls and guitar harmonics can easily be triggered here, adding greatly to a performance. The more electric sounds are good too, including the analogue style pads, basses and leads and electric guitars and basses, though they are all let down by the on-board filtering, which sounds wide, full and rich when static but seems to have quite acute stepping when changing the cutoff and resonance via the panel dials. This seriously needs looking at by Yamaha as it's unacceptable at any price point. The weakest sounds are most definitely the clavs and organs, and it's annoying there is no way to use the dials as drawbars. Also of note is the very powerful arpeggiator, which has plenty of useful presets for inspiring creativity, or to use as an auto accompaniment tool for solo performers. You could also line up six arps in a performance patch and use each one to represent a different section of a song, for example. To conclude, the MOX 8 basically offers the Motif XS sound in a more convenient package. It really can do a lot of what the XS does at a much lower price point with significantly less weight. However it's perhaps the 61-note synth-action MOX 6 that's the real MOX star, being even lighter and at a street price of just £899. The built-in audio/MIDI interface, dedicated DAW volume slider and remote controls, effectable A/D input and bundled software are all useful however, in operation we still feel it could be made more intuitive and still needs more dedicated dials and sliders to reel in live performers, which is a big part of its intended market.